Okay, so you're not a 'high-fashion' type of girl. That's totally okay! You can look comfy and cool at the same time—in fact, comfiness conveys a specific type of cool you can't get anywhere else! A laid-back, can't-be-bothered-to-wear-heels-because-I'm-too-busy type of cool. An almost too-cool-to-try-to-look-cool type of cool. Right? Besides, have you thought about the life of a superhero? Though most of them make it look so, being a superhero is anything but easy. We task each and every superhero to protect the planet, to save lives, and to keep a presentable look about them. You know, for the kids. Being such role models, their costumes must be in tip-top shape: washed, pressed, smelling of rosewater. Probably form-fitting for easy maneuverability in and out of danger. We all know these things. There's nothing new here. But a little-known fact about superheroes—acquired by the HalloweenCostumes.com crew by means we're unwilling to discuss here and now—is that every other Friday is Casual Friday. 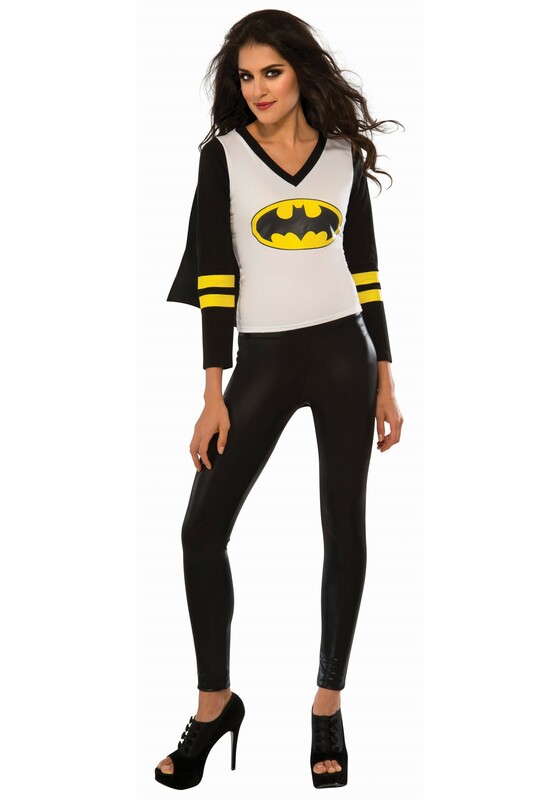 This means Batgirl can wear her ultra comfortable t-shirt version of her costume while stopping bad guys in their dingy tracks, still with a cape to provide the all-too-necessary aerodynamics. So if this is more your style than spandex, be sure to pick up your utility belt to complete this Women's Batgirl Sporty Tee and Cape. The last thing to decide is between sneakers and heels—but we won't fault you for either.